no thanks File didn't download? Click here. 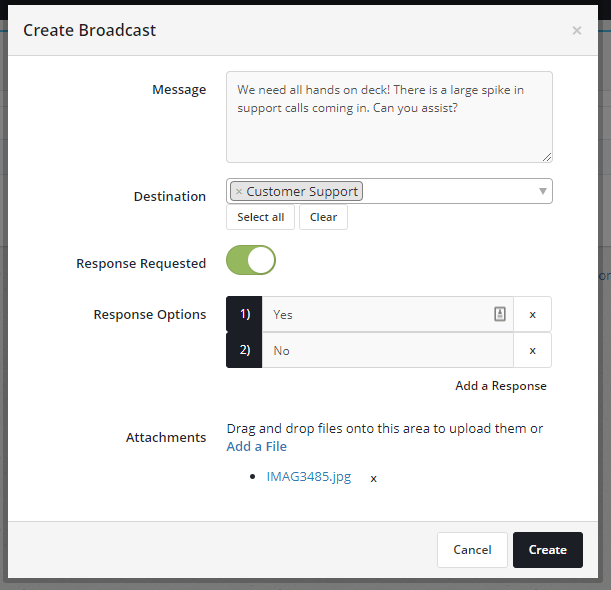 Today, we are excited to announce PagerTree now officially supports Broadcast Responses! With PagerTreeтАЩs Mass Notification System (MNS) your organization will be prepared to easily communicate with speed and reliability during critical events. Send mass notifications to your entire organization through Push, E-mail, SMS, and Slack. Add attachments to your notification to give additional context. Add response options for two way communication. See deliverability, who has or hasnтАЩt responded, and what the responses were. Mass Notification Broadcasts are available on our Pro pricing plan. To get started is easy, simply follow the knowledge base guide. If you donтАЩt already have an account, sign up for a free-trial now.